Nissan’s new compact crossover will fly into Australia in early 2008 on the back of boosted green credentials that will help reduce the company’s carbon footprint and add to production efficiencies. The new Dualis is being sourced from Nissan Motor Co’s Sunderland plant in the UK where six wind-powered turbines currently produce five percent of the factory’s total power needs. Another two turbines are being added to the on-site wind farm in January and take the power contribution up to six percent. This will deliver a cost saving of nearly $A2.5 million a year and offset rising energy costs. In addition, carbon dioxide emissions will be cut by up to 4,000 tonnes a year at power plants which currently supply the Sunderland factory with power. Nissan established the wind farm technology on the site two years ago. 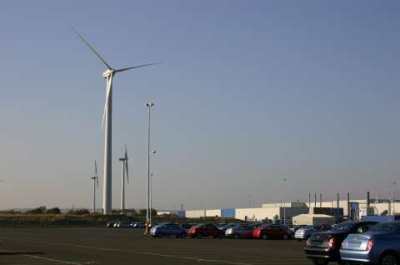 The Sunderland Plant’s wind farm is the first of its kind within Nissan globally and its expansion supports the company’s global Nissan Green Programme 2010. Planning for the expansion of the wind farm, located within an industrial area just 5 kms from the coast, took into account the needs of local residents and ensured the farm met noise level guidelines. Unlike most wind farms, Nissan’s is enclosed entirely within an industrial area on low-lying ground thus minimising the impact on the local environment. The site is also home to a protected species - great crested newts. Nissan will relocate the newts to a temporary home on the site before installation. Once the extra two turbines are in place, the newts will be able to return to their habitat around the turbines. The wind farm’s expansion supports the Nissan Green Programme 2010, which focuses on reducing CO2 emissions from Nissan’s products and activities around the world; reducing other exhaust emissions; and accelerating recycling efforts. Nissan employs approximately 4,300 people at Sunderland. The plant currently produces Dualis (Qashqai in Europe); the Note; and Micra.